Seeing most people turn dining rooms into a play room, office, or a free for all (junk room), I wanted to bring back the dining room with the era of the house. The swinging door into the kitchen takes up a lot of space and creates a barrier. I am creating a more open concept by removing the kitchen door and hallway door, making the room appear larger. With the beautiful archway, large windows with natural light pouring in, and tall ceilings I knew the dining room would be perfect for adding some character to the space. I wanted to be very cost effective but create an expensive look and another focal point. Using 1 x 4’s vertically and horizontally with a 1 x 2 as the ledge on top, created a “board & batten” look. There are many different ways to approach this.. a lot of it is about personal preference or what suits the space you are in. I thought this design was the best solution for this space. I used the same “board & batten” look creating another focal point across the kitchen and carrying it down to the landing of the stairs. With this I created a space to hang coats using a 1 x 6 at the top with a 1 x 2 ledge and 1 x 4’s vertically. Just have to add the hooks! I wanted to add that character throughout the house. 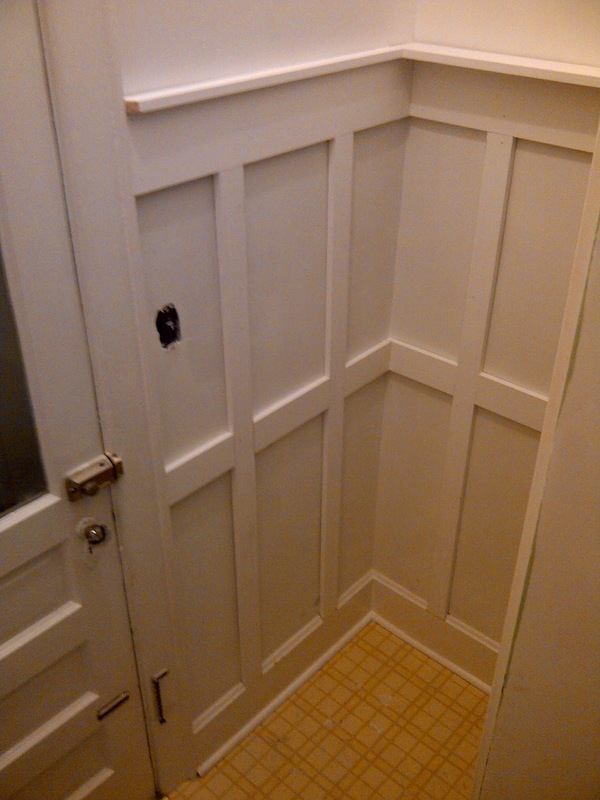 In the guest bathroom wood paneling was the best solution using 1 x 6 horizontally and 1 x 2 for the ledge at the top. I created the illusion of the bathroom seeming longer than what it actually is. In the master bathroom, I used tongue and groove pine vertically to emphasize the height of the tall ceilings. Can't wait to show you what I did to that beat up plaster wall! Here is a sneak peak of the tile I picked out being installed. And this is all what we have been waiting for… AFTER Pictures, coming up soon!